IT TOOK NEARLY TEN YEARS and a journey of three billion miles, but the space probe New Horizons finally flew close by the sub-zero world of Pluto on July 14, 2015. And here is Mat Irvine’s account of scratch-building a 1:8 scale model of the probe for a BBC TV show. Mat Irvine: Models of space probes within the space industry are relatively plentiful, as they are often needed for design and engineering purposes, and even for CEOs’ desktops. But when it comes to commercial kits, they are the poor relation, compared to models of launch rockets and manned spacecraft. Consequently, when I needed to supply a New Horizons model for the BBC2 series Stargazing Live in March 2015, there was no other way but to build it from scratch. Having said that, there is a paper model available from NASA here. The NASA link also gives downloadable models of Pluto and the Pluto-Charon twin-body system. 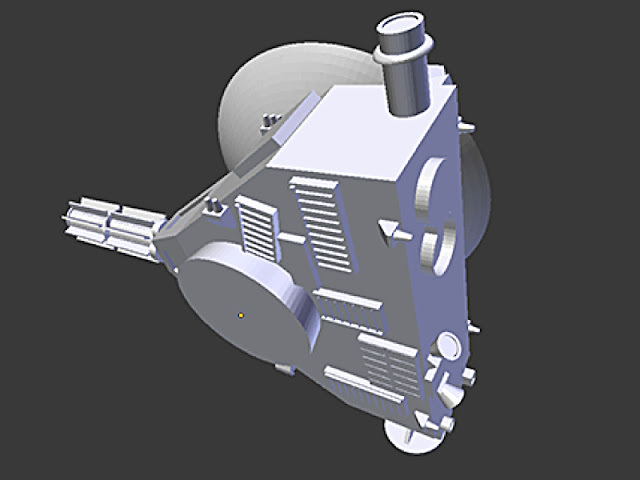 There are 3D model files available too, which are also available direct here. However, the paper model wasn’t big or detailed enough for TV show needs. But it was very useful as a guide, along with a pile of photographs and diagrams. I drew up rough plans, and started the build. Frankly, there’s no point in being too pernickety about precise plans, as TV schedule constraints usually mean getting on with the build, most problems sorting themselves out along the way. Finished 1:8 scale model (below) with some of the info used as reference. I built much of the New Horizons from stock polystyrene sheet, with detailed structures built up from EMA parts, known as Plastruct in the hobby trade. First intended for professional model-makers, EMA also became a mainstay of the miniature effects industry, especially in the 1970s and 1980s. Computer graphics in both movies and TV have reduced EMA’s usage, but ‘real’ models are still made, even if they are then scanned to be rendered digitally. So, fortunately, EMA is still around. My workshop at Jodrell Bank (above, below) was in a spare office. The 1:8 scale model as it appeared (above, below) on Stargazing Live in March, based at the Jodrell Bank Radio Telescope site, UK. The presenters were Dara O'Briain (left) and Professor Brian Cox. I’ve always made TV display spacecraft in the same way that a science fiction spaceship would appear - as it looks in space, with thermal insulation in place - which can also, ahem, hide a multitude of construction sins! Interestingly, BBC News from Mission Control in Maryland, and later The Sky at Night, used a bigger 1:4 scale New Horizons model without insulating foil, but I don’t think it looked quite right. In the past, obtaining foil was down to buying chocolate bars, and lots of them. This was just to get the gold foil wrapping, honest! Once I’d bought a dozen large - and I do mean ‘large’ - bars, I could reckon to have enough foil to cover a fair-size model. But I did get heartily sick of chocolate, and fortunately some years ago, located a source of the raw gold foil, before it was turned into chocolate wrappers. Applying the gold foil (below) is a careful process, especially on the thin antenna struts. I use spray glue to attach foil to the various components, remembering that a smooth finish is not required, 99 percent of the time. The most tricky thing with New Horizons was the high gain antenna dish. I usually make such items by vacuum forming styrene sheet, but this one needed a large vac-former. Fortunately, I had a spare in stock, even if I might have had to use an alternative - the pro’s stand-by can even be a plastic plate, which is fast and cheap! Printout plans (above, below) for the 1:25 scale NASA paper model. Assembled paper model (below) with cover for the instructions. The 1:25 scale paper model (above, below) compared to the 1:8 scale scratch-built TV version. Paper model (below) compared with a suitable 1:25 scale plastic kit vehicle, the MPC Moonscope. Computer graphic 3D representation (below) of New Horizons. Mat (below) with the scratch-built model. The T-shirt came from the Lowell Observatory in Arizona, where Clyde Tombaugh discovered Pluto in 1930. 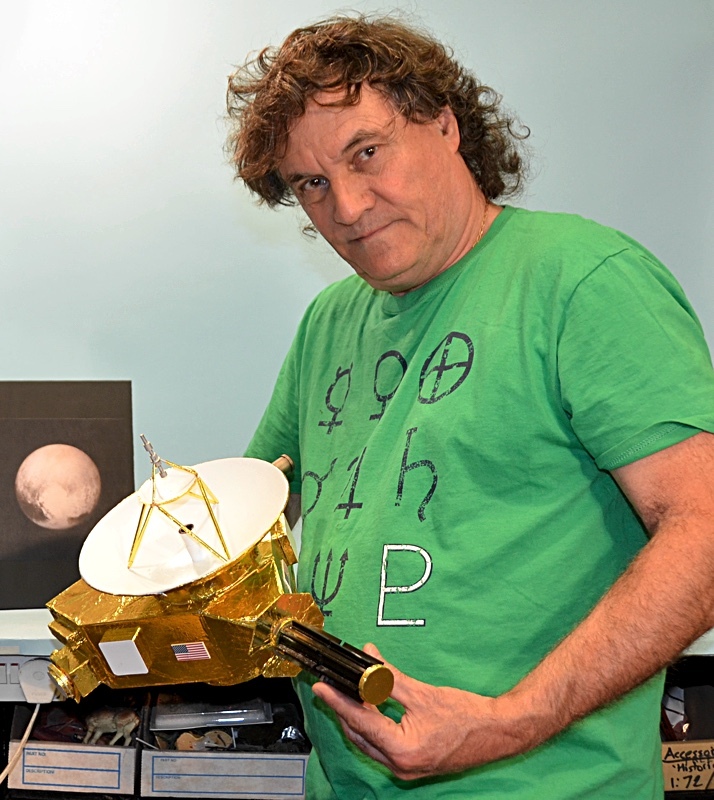 Note the ‘PL’ symbol for Pluto. Signs at the wooded entrance to the Lowell Observatory (above, below). Wooden stature of Percival Lowell (below) by the Pluto Walk, on the way to the observatory that Tombaugh used. At Lowell, you can vote (below) to reinstate Pluto as a ‘proper’ planet, instead of remaining in its present status as a dwarf planet. The New Horizons mission was planned as a way to understand where Pluto and its moons ‘fit in’ with other objects in the Solar System, the inner rocky worlds - Mercury, Venus, Earth, Mars - and the outer gas giants - Jupiter, Saturn, Uranus, Neptune. Pluto and its largest moon, Charon, are in a third category, the ice dwarfs. These have solid surfaces but a significant portion of their mass is icy material. Before the probe flew past Pluto on July 14, the New Horizons team had used the Hubble Space Telescope to discover four previously unknown Plutonian moons, Hydra, Kerberos, Nix, Hydra, Styx. But New Horizons has not finished its mission, as it is now flying on to explore the outer Solar System, way beyond Pluto. SMN note: OK, the models below aren't of New Horizons, but the Hasegawa Voyager looks particularly interesting - click here for SMN article - as does the Eduard detail-up accessory pack. The Dragon 1:72 scale Apollo 12 set is a must-have for any space fan.